Marietta (GA), United States – Dos Santos International is now starting up one of two DSI GPS (Gently Pressed Sandwich) high angle conveyors for the Paris Tunneling Project. DSI was awarded a contract to provide two vertical DSI GPS systems for H+E Logistik. The DSI GPS will each elevate 800 t/h of tunnel muck at a 90°angle. The Grand Paris Express is the most ambitious new subway project in the Western world. The extension is a USD 25 billion expansion of the century-old Paris Metro. The DSI Sandwich belt high angle conveyor will elevate 800 t/h of tunnel muck at a 90° angle. A particular challenge of this project was the requirement to provide a versatile system that will be reusable in future projects. Accordingly, DSI designed a system with a high degree of versatility – particularly extendibility. With all the drive and take up equipment concentrated at the head end, DSI designed the vertical portion as a hanging structure which can be extended as necessary for higher lifts at future applications. The two conveyor designs are nearly identical, with only a small variation in the length of the vertical portion. 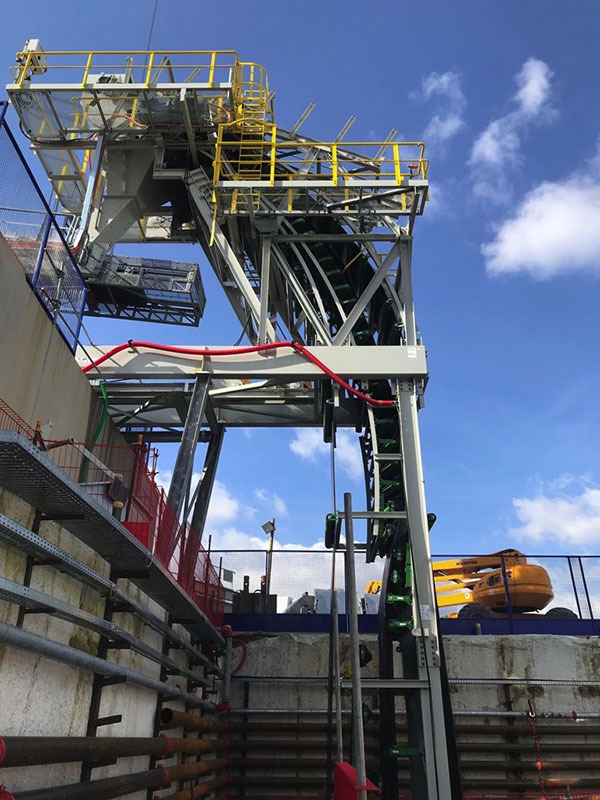 DSI designed these conveyors for the possibility of increasing the lift to 40 to 45 m. The two conveyors in Paris are 24.6 m and 26.3 m and can be used for any intermediate height up to 45 m. This makes them very versatile for use at future prospect sites. 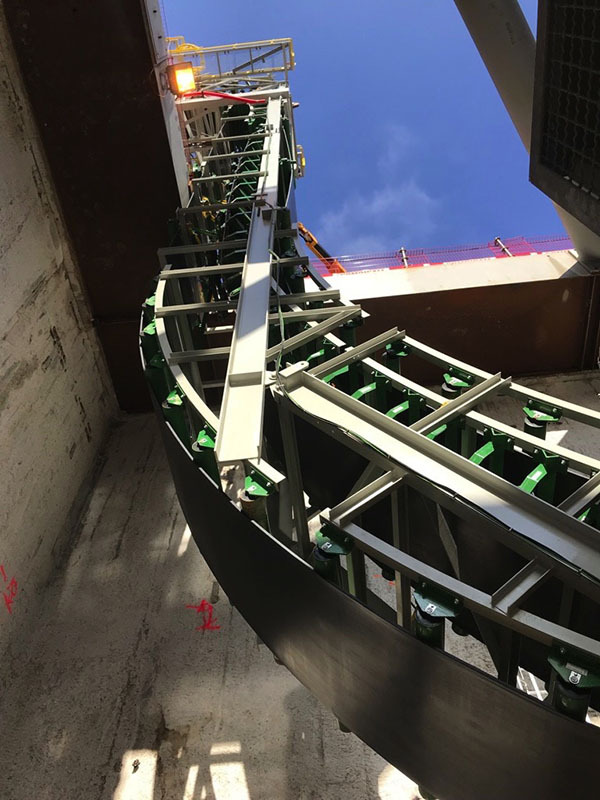 Generally, and particularly in tunneling projects, a recurring challenge is to accomplish the sandwiched, curved transition from the low conventional loading angle, up to the, typically vertical, high angle while conforming to the vertical radius of curvature constraints of troughed belts. This is something DSI understands well. Often transition curves are offered too tight resulting in premature failure of the belt due to edge overstress and material spillage due to the belt’s relaxation at the middle. Dos Santos International has proven they can always solve these problems without compromising the technology, performance and belt life. DSI GPS is able to elevate material economically, at high volumetric rates in limited vault space. A DSI sandwich conveyor is capable of higher conveying speeds and greater capacity than other high angle conveying methods. The availability of wide belts and hardware makes capacities greater than 10,000 t/h easily achieved with a DSI Sandwich conveyor. High angles of 90° are typical, and lifts of 300 m are easily accomplished.